I gained about 60-65 with #1 baby and was surprised when he was only 7 lbs at birth and not a 60 pound baby!! It was pretty bad considering I didn’t even show until like 20 weeks and had morning sickness lose 10 lbs the first trimester. There I was approaching the big 200 a week before his due date and went into labor before I could actually reach that. Pheww… I did not lose it quickly, but by eating right and exercising with Tristan I got back to my pre-prego weight but never my size! Grrr… BF helped a bit but the pounds did not melt away like I had heard. This time I am worried cause I am already showing like I did at 30 weeks and I am just 20… good news though, the baby was so big on the ultrasound, they moved up his due date. Yea! Your weight will be fine in the end… just get the nutrition he/she needs right now and some cravings for you too, and you can worry about getting it off much much later. Thanks for sharing about this and more on your heart, Michelle. We’ll keep praying!! First off you still look amazing girl!! Secon I would love to read how people are getting the baby weight off. I only gained about 35 pounds with Kaitlyn. I did not show for a very long time. The doctors told me I would be having a 6-6.5 pound baby and she ended up being 8lbs. HOWEVER I have actually gained more weight since having baby girl than I would have ever hoped. I only can make it to gym about 2-3 times a week and probably should eat a lot less of my favorite chicken salad and cheese Itz. I just don’t know exactly how to do it. So there is my confession, I can’t blame it on baby girl, I’m gaining the weight after pregnancy. So again I would love to know the tricks to losing the weight. Glad Jason got to feel baby move, that was Adam’s issue because of my placenta being in the front as well. Can’t wait to see everyone and meet the new baby! Oh Michelle I do love all your blogs! I gained 40 pounds and it would have been more but I was 3 weeks early. I remember being at that 23 week appointment and gaining 10 pounds in a month. I think I had a panic attack. My doc was cool thank goodness. It is hard you have an ideal weight to gain bit sometimes your body tells you different. (Granted I ate a lot of ice cream and whatever else). The weight did not melt off me either. What a myth. Those people must not be eating like crazy due to the insatiable breastfeeding hunger! I had an extra 5-8 lbs that hung on until recently when I truly tried to change my diet. 30 day detox from arbonne. Love love love it. Helps flatten the belly and bum but not till you are done breadtfeeding. Weight watchers is what a lot of moms do post baby with success. Didn’t work for me! Love your honesty Michelle! You look beautiful. I’ve had 3 babies and all 3 pregnancies have been different. With my 3rd, I gained 40ish pounds. My baby weighed 11lbs (yes, it hurt!) and I left the hospital 20lbs lighter! Breastfeeding did not help me lose weight at all! When he was approaching his 1st birthday, I decided to get serious about losing the weight. I joined WW online and finally lost the last 20lbs. Now is the hard part, keeping it off! Running and Jillian Michaels workout DVDs are the way to go for me! Good luck, Michelle! Chasing around 2 babies will be a great workout for you! My goal during my pregnancy with Ashlyn was to only gain 30 pounds. Well, I stopped tracking after I gained 40, and can safely say I gained 45 give or take myself. I didn’t feel like I was eating irresponsibly, so I just let it go. I also ended up with a CRAZY breast feeding obsession/craving of TollHouse’s chocolate chip cookies. I would by buckets of cookie dough and bake them every day. Andy even knew to not touch my cookies! 😉 It was my happy sanity food as I was struggling with the transition into mommy hood and breast feeding. I also suffered from 8 months of postpartum depression. SO, after the initial 20-25 pound loss, breast feeding (even with all my cookies) slowly took off 10-15 more over the first 7-8 months. At Ashlyn’s 8-9 month mark, I couldn’t take my depression anymore, or the 10-15 pounds I couldn’t kick (again not being totally irresponsible with eating, but not being really good either), so I started running to help start to kick both of them out/off. Ashlyn loved to go out in her stroller, so it motivated me to get out not just for me, but for her too. I always said to myself, it took me 9-10 months to put it on, so I’ll give myself a year to get it off. Well, finally at 13 months, I got back to post pregnancy weight. I pretty much did it through old fashion cooking my own meals at home (rarely eating out) and light, but consistent work outs (walking, running, and occasional push ups, sit ups, lungs, etc. Things I didn’t need a gym or equipment for). You got pregnant again before you could have a realistic amount of time to get more weight off, so your body went into baby housing/growing mode. It’s not going to easily get that weight off and that’s ok. I remember hearing how when pregnant, you really only need an extra 100-200 calories a day. That is all of an extra healthy snack. Maybe keeping that frame of mind will slow down the weight gain a little. Who knows. What I do know is that I have a dear friend who gained 100 pounds with her first pregnancy and 60-65 with her second. Over time and now knowing she is not having any more babies, she is at the skinniest she has ever been. But it has taking slow and steadiness to get there. You are beautiful, your husband and son love you immensely, and as long as you are keeping you and baby healthy, don’t be tempted to be hard on yourself or insecure. nooooo. stop the craziness. the scale does not tell the whole story. you are NOT 45 lbs over your goal weight. you are growing a human. you are part of that universal fellowship of women who have left their adolescent body behind and are nurturing life inside a lovely woman’s body. US weekly would have us believe that you should do that without a thigh dimple and within 6 weeks be strutting the runway. i say– US weekly can bite me. It’s really challenging to get to a good place with weight, I think. Enjoy this pregnancy and you’ll be able to take care of the weight after. I remember this being such a big deal for me when I was having babies, so I totally understand. I thought I was going to be “fluffy” the rest of my life. I gained between 30-35 pounds with all 3 pregnancies. It did not come off quickly for me. In fact, my body likes to keep a layer of fluff while I’m breastfeeding. So, it wasn’t until I stopped nursing that I would suddenly drop 20 pounds in a matter of weeks. People always wanted to know what crazy diet I was on. Ummm, no diet, just stopped nursing! It’s been 8 years since my last baby and I can honestly say I wish I hadn’t worried so much. It now seems so silly, because I was doing all that I could do to just survive those years. You will soon understand this with your babies being so close together in age. I never had tons of weight to lose, only like 10-15 pounds, yet I was obsessing over it. I wish I had just enjoyed my body in the moment, relished in the wonder of carrying and nursing babies and realized that some day in the not too far off future I would have more time and energy to put the effort into losing those last few pounds. In the last few years I have been able to lose those last extra pounds, and after I did- it really wasn’t a big deal- because I realized those pounds did not define me. In those early years, parenting is so physically exhausting. You are constantly lifting, carrying, bathing, changing, rocking, nursing, feeding and everything else under the sun. It’s no wonder young moms find it hard to exercise- they do it all day long! As the kids get older the parenting changes from being physically exhausting to mentally exhausting. You will find yourself trying to keep track of everyone’s schedules, wondering if they will come home when you told them too, trying to prepare them for the real world and all it’s very real problems, and realizing you only have a few more years before they leave the house! It’s a different kind of tired, but it is easier to find time to exercise, and you will probably enjoy it more because it will be your time to think. on June 21, 2012 at 12:27 PM | Reply Kristen D.
I remember telling myself at the beginning of my pregnancy, there was no way I’d go over the recommended 25 pound weight gain… I gained 38 pounds. I am 9 weeks past my baby’s birthday and have 5 pounds left to get to my starting weight (I’d love to be 5 pounds lighter than that, but thinking about it is overwhelming). I think it may take me months to lose those pounds. It just took me six weeks to loose three pounds! Of course I’m not dieting because I don’t believe in it. But I am watching what I eat and exercising when I can. Maybe it’s time for me to join Weight Watchers, but I can’t seem to get into it… Love your honesty in this post! I just had my son, Everett, 4 months ago and at my last prenatal appointment end of February, I almost had a stroke. I had gained 65 pounds this pregnancy and I am 5’1″. I couldn’t believe it! Their fancy scale must be wrong, right?! A few days later, I had E. and he was 9 pounds 12 ounces (which definitely helped!). When I got home from the hospital, I allowed myself to eat whatever I needed/wanted for 2 weeks. Then slowly, I started eliminating the junk from my diet. One week it was fried food, then followed by candy/baked goods and so on. It was easier for me to ease into healthy eating. After the 6 week mark, I started the Advocare 24 Day Challenge. I lost 8 pounds in the first 10 days and have gone on to lose a total of 35 pounds so far. I’m still on the challenge and I feel great. It has helped a ton with my energy. I want to lose another 20 pounds to get back to my pre-baby weight. My husband agreed to do the challenge with me as an accountability partner, thinking he had nothing to lose, and he lost 7 pounds. He didn’t think he had anything to lose! Nice, right?! My favorite part of this new “healthy living”, it is rubbing off on my family. My daughter, Audrey (who is 5 and a super picky eater) is eating healthier because she sees what my husband and I are eating. My sisters and parents are also jumping on my healthy eating kick. It’s nice to have a support group that all have a similar goal in mind. Sorry this was so long! Don’t worry about the weight gain. Enjoy your pregnancy. As long as your Doc isn’t worried, you shouldn’t be either. Let me know if you want more info about the 24 day challenge. It has been amazing for me and my family. Michelle, you look wonderful! I know the guideline is 25-35 pounds, but I really don’t know many people who fit into those numbers. I think some women’s bodies just need to gain more weight to grow the baby. 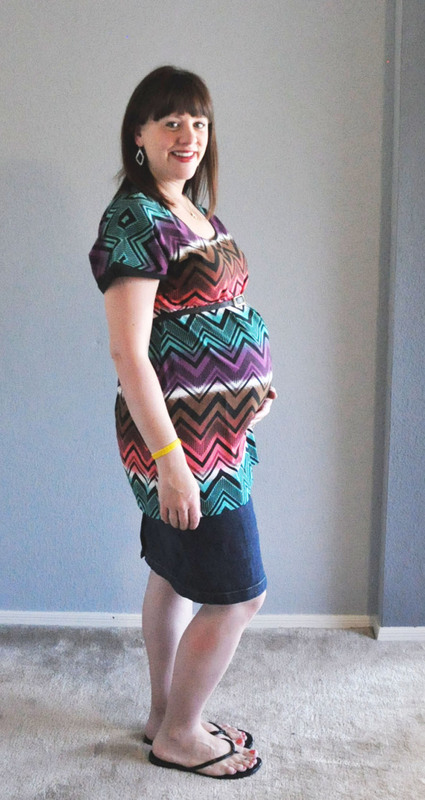 I gained 42 pounds during my pregnancy with Claire. And that was despite the fact that I ran through my fifth month of pregnancy and exercised fairly regularly during the rest. I could have been more restrained with my diet, so that’s what I might work on next time to hopefully gain less, but it’s hard to do that when you are feeling sick, hungry, tired, and are having strange cravings. (My craziest craving: KFC biscuits!) Honestly, I wouldn’t worry about it too much. I lost close to 20 pounds by two weeks postpartum, which sounds miraculous, but I was REALLY retaining a lot of water. (Getting preeclampsia did not help.) I started working out again, but sometimes that was sporadic, and I didn’t worry too much about my diet because I didn’t want to jeopardize my milk supply. I basically just ate my normal, non-pregnant lady diet. Around Claire’s birthday, I realized I was back to my pre-pregnancy weight. It just takes time, no matter what People magazine says. For now, just enjoy your pregnancy, and if baby wants a bowl of ice cream, by all means don’t deny him/her!